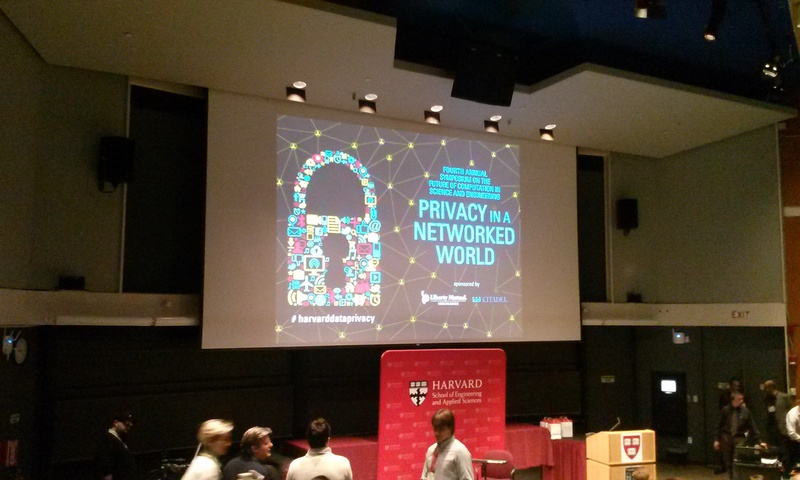 This is the first post about Privacy in a Networked World, the Fourth Annual Symposium on the Future of Computation in Science and Engineering, at Harvard on Friday, January 23. Bruce Schneier is a fellow at the Berkman Center for Internet & Society, and the author of Data and Goliath. Edward Snowden was a sysadmin at the NSA who revealed the extent of the government’s mass surveillance. The conversation was recorded (no joke) and is available on YouTube. I have to say it was an incredibly cool feeling when Snowden popped up on the giant screen and was there in the room with us. There was sustained applause when he first appeared and also at the end of the conversation, when he was waving goodbye. Schneier started by asking Snowden about cryptography: What can and can’t be done? Snowden replied, “Encryption…is one of the few things that we can rely on.” When implemented properly, “encryption does work.” Poor cryptography, either through bad implementation or a weak algorithm, means weak security. End points are also weak spots, even if the data in transit is protected; it’s easier for an attacker to get around crypto than to break it. Snowden pointed out a shift in the NSA’s focus over the last ten years from defense to offense. He encouraged us to ask Why? Is this proper? Appropriate? Does it benefit or serve the public? Schneier, using his NSA voice, said, “Corporations are spying on the whole internet, let’s get ourselves a copy!” (This was much re-tweeted.) “Personal information,” he said, “is the currency by which we buy our internet.” (Remember, if you can’t tell what the product is, you’re the product.) It’s “always amusing,” he said, when Google complains about the government spying on their users, because “it’s our job to spy on our users!” However, Schneier thinks that the attitudes of tech companies and standards bodies are changing. These silos of information were too rich and interesting for governments to ignore, said Snowden, and there was no cost to scooping up the data because until 2013, “people didn’t realize how badly they were being sold up the river.” Schneier said that research into privacy-preserving technologies might increase now that there is more interest. Can we build a more privacy-preserving network, with less metadata? Snowden was a tough act to follow, especially for John DeLong, Director of the Commercial Solutions Center for the NSA, but that’s exactly who spoke next. Stay tuned.